At Resolve Attorney Mediators of Rochester, we understand that the mediation process is likely something new for you. We’re here to address all your questions and concerns so you can feel confident about your decision on how to proceed. Below you will find general answers to common questions about mediation. For guidance on your specific situation, we invite you to contact us. Mediation is an alternative, out-of-court way to resolve divorce, separation, child custody and other family law issues. In contrast to the adversarial nature of the court process, mediation is designed to foster a cooperative, open discussion with the help of a professional facilitator. Ultimately, the goal of mediation is to return the decision-making power to your hands, so you can have a say in the decisions that will impact your future. Read more about the many advantages of mediation. The mediator is a neutral third party who facilitates the mediation process, setting the agenda for each session and guiding the discussion. Unlike non attorney mediators, who may have little or no legal training, our mediators have 40-plus years of combined experience as practicing lawyers. This means we can more effectively help couples make informed decisions in light of legal realities. We also handle preparing and filing all the necessary paperwork to finalize the divorce. Find out why it’s so important to work with an attorney- mediator. Mediation is a much faster, more efficient process than court proceedings. However, the exact timeframe depends on your situation — the complexity of the issues you’re facing, whether you can readily reach an agreement and the dynamics of your relationship. Some couples may resolve their case in only a handful of sessions, whereas others may require additional time. Our mediators will accommodate your unique needs to work toward a resolution on your timetable. Learn more about what to expect during the mediation process. Traditional divorce and custody litigation can cost you a fortune. Ultimately, most of that money goes to padding your lawyers’ pockets. Mediation involves far less cost than litigation. One of the goals of mediation is to keep your money where it belongs — in your pockets, not ours. During your initial consultation, we’ll go over exactly what to expect in terms of fee structure so you can have a full understanding upfront of what to expect. Get answers to whatever questions you may have about mediation. Call our office in Rochester, New York, at 585-256-2109 to learn more. 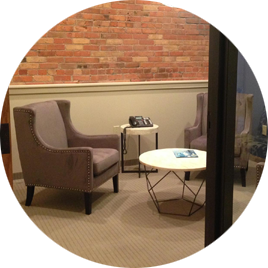 We offer a warm and welcoming environment in a renovated carriage house in the historic East Avenue District.